The Holy PriestMartyrs Basil, Ephrem, Eugene, Elpidias, Agathodoros, Etherias and Kapiton carried the evangelium (Good News) of Christ into the North Black Sea region from the Danube (Dunaj) to the Dniepr, including the Crimea, and they sealed their apostolic activity with a martyr's death during the IV Century in the city of Tauridian Chersonessus. Long before the Baptism of Rus' under Saint Vladimir, the Christian faith had already spread into the Crimea, which in antiquity was called Tauridia and was ruled by the Roman emperor. The beginning of the enlightenment of Tauridia is attributed to the holy Apostle Andrew the First-Called (+ 62, Comm. 30 November). Its very enemies even contributed to the further spread of Christianity, and contrary to their intent: the Roman emperors banished to this area transgressors against the state, – which Christianity and the confessors of Christ were considered to be during the first three centuries. Thus, during the reign of Trajan (98-117) Saint Clement, Bishop of Rome (+ 101, Comm. 25 November), was exiled for imprisonment to the Inkermann stone-quarry. There he continued with his preaching, and there also he accepted a martyr's end. The pagans inhabiting the Crimean land stubbornly resisted the spread of Christianity. But the faith of Christ, through its self-denying preachers, grew strong and was affirmed. Many an evangeliser gave his life for this struggle. At the beginning of the IV Century a bishop's cathedra (presiding-chair) was established at Chersonnesus. This was a critical period, when Chersonnesus served as a base for the Roman armies, which constantly passed through in their dependence upon Byzantium. During the reign of Diocletian (284-305), in the year 300 (that is, still before the persecution which the emperor started in the year 303), – the Jerusalem Patriarch Hermonos (303-313) dispatched many bishops for preaching the Gospel in various lands. Two of them, Ephrem and Basil, arrived in Chersonnesus and planted there the Word of God. Later on, Saint Ephrem went to the peoples living along the Danube, where he underwent many tribulations and sorrows. At the time of the start of the persecution he was beheaded (exactly known is only the day of his death – 7 March). The preaching at Chersonnesus was continued by Saint Basil, the companion of Saint Ephrem. He set many idol-worshippers onto the pathway of truth. Other wayward inhabitants of the city, enraged at his activity, showed wrathful resistance: the saint was arrested, mercilessly beaten and thrown out of the city. Having withdrawn to a mountain and settling in a cave, he incessantly prayed God for those that expelled him, that He might illumine them with the light of true Divine-knowledge. And the Lord sent the unbelieving a miracle. The only son of an important citizen of Chersonnesus died. The dead one appeared to his parents in a dream and said, that a certain man named Basil by his prayers to the True God could resurrect him from the dead. When the parents had searched out the saint and besought him to work the miracle, Saint Basil answered, that he himself – was a sinful man and had not the power to resuscitate the dead, but the Lord Almighty could fulfill their request if they were to believe in Him. For a long time the saint prayed, invoking the Name of the Holy Trinity. Then, having blessed water, he sprinkled it on the dead one, who then came alive. The saint returned to the city with honour, and many believed and were baptised. Soon, by order of the emperor Maximian Galerius (305-311), the persecution against Christians spread with renewed force. The Christ-haters rose up also against Saint Basil: on 7 March 309 he was dragged at night from his house; they tied him up, dragged him along the streets and beat him to death with stones and canes. The body of the saint was thrown out of the city for devouring by dogs and birds, and for many days it was left unburied, but remained untouched. Then Christians secretly buried the body of the holy martyr in a cave. A year later, having learned of the martyr's death of Saint Basil, three of his companions – Bishops Eugene (Eugenios), Elpidias and Agathodoros – left off their preaching in the Hellespontine region, and arrived at Chersonnesus to continue his holy work. They underwent many hardships for the salvation of human souls. All three bishops shared the fate of their predecessor – demon-driven pagans likewise stoned them on 7 March 311. After the passing of several years, a time already during the reign of holy Equal-to-the-Apostles Constantine the Great (306-337, Comm. 21 May), Bishop Etherias arrived in Chersonnesus from Jerusalem. At first he also encountered hostility on the part of the pagans, but the holy emperor in declaring freedom for the Christian faith would not tolerate acts of violence against the preacher: he issued a decree, by which it was declared that at Chersonnesus the Christians should be able to make Divine-services without hindrance. Through the efforts of Saint Etherias a church was built in the city, where the saint peacefully governed his flock. To thank the emperor for protecting the Christians, Saint Etherias journeyed to Constantinople. On the return trip he fell ill and died on the island of Amos (in Greece) on 7 March. In place of Saint Etherias, the holy emperor Constantine sent to Chersonnesus Bishop Kapiton. The Christians met him with joy, but the pagans demanded from the new bishop a sign, so as to believe in the God Whom he preached. Placing all his hope on the Lord, Saint Kapiton in clergy garb went into a red-hot bonfire, and for a long while he prayed in the fire and emerged from it unharmed, gathering up in his phelonion the red-hot coals. Many of the unbelievers were then persuaded in the power of the Christian God. About this miracle and the great faith of Saint Kapiton, reports were made to Saint Constantine and the holy fathers of the First OEcumenical Council (325). After several years Saint Kapiton journeyed on business to Constantinople, but the ship hit a storm at the mouth of the Dniepr River. The local people (pagans) seized hold of the ship and drowned all those on board, including Saint Kapiton. This however occurred on 21 December. 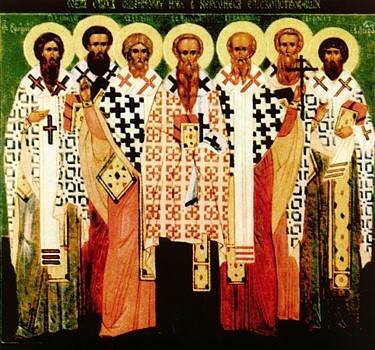 The memory of the holy bishop of the Church was set in conjunction with the other Chersonnesus PriestMartyrs – 7 March. The preaching of the priestmartyrs strengthened the faith in Christ in the Chersonnesus. From the beginning of the V Century this city became a spiritual centre, from which Christianity spread northwards towards Rus'. And all the more during the IX Century Chersonnesus exerted influence on the Russians, who had begun to settle in the city. Present-day archeological excavations have shown, that in the city were more than fifty churches, dating to the V-XIV Centuries. In the year 987 it was at Chersonnesus that holy Equal-to-the-Apostles Prince Vladimir accepted Baptism. This ancient city was a cradle of Christianity for Rus'.